Matty Swink lives under the sink in Fenella Finch’s disgusting Diner. 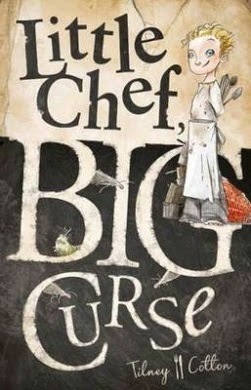 He dreams of becoming a famous chef, but instead, he scrapes the dregs and grease off her revolting pots and plates. One day the King of Yurp announces a Grand Cook-Off . Anyone who creates a dish that Princess Meg can’t refuse will become the new Royal Chef. Too easy? Think again. There’s a distinct lack of ingredients, some meddling Moon Mice and the dreaded Fenella Finch standing in Matty Swink’s way, not to mention a 500-year-old curse. Is the kingdom of Yurp doomed or can Mathew Swink cook up a storm big enough to dissolve the ancient curse and does that nagging itch at the back of his memory hold something important? Get ready for a bit of ridiculous and a lot of surprises when you dive into Little Chef Big Curse. It’s a lot of fun, in a crazy, fantastical sort of way.